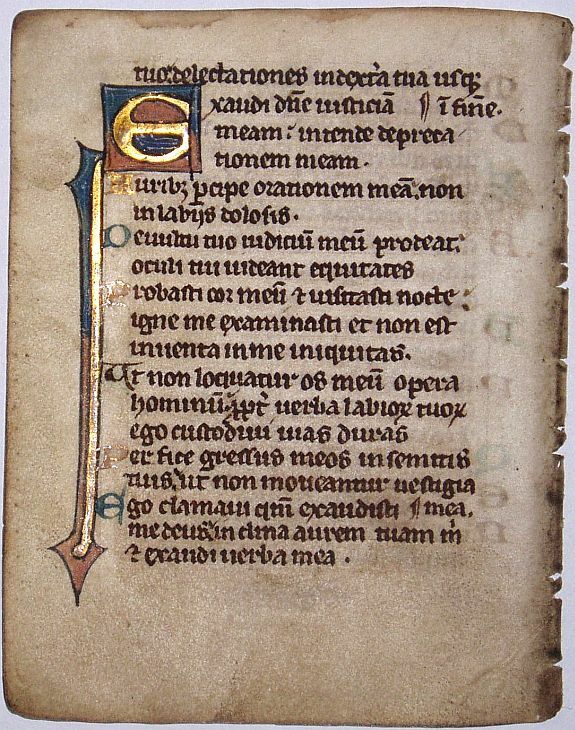 BREVIARY -Leaf on vellum from a manuscript Breviary. BREVIARY - Leaf on vellum from a manuscript Breviary. Title : Leaf on vellum from a manuscript Breviary.. Date : France, ca. 1250. Size : 4.5 x 3.5 inches. / 11.5 x 9.0 cm. Description :A vellum leaf of over 750 years old! The calf whose skin was used for this piece of parchment grazed the gently rolling hills of Flanders at the time of the last Crusades!! The vellum is quite firm : the booklet, a breviary (A liturgical book used for the celebration of the Divine Office. All members of monastic orders and the clergy are committed to the daily recitation of the breviary. It was popularized by the Dominicans and the Franciscans in the 13th century.) was meant to be carried about, every day, by traveling monks. The most striking feature of this leaf is the initial E with a tail in the margin in blue and mauve with gold leaf!! In one margin we can see the pinpricks made for the ruler. The other initials are in blue and gold. The text is from the psalms, 15 and 16: [ Multiplicatae sunt infirmitates eorum postea adceleraverunt non congregabo conventicula] eorum de sanguinibus nec memor ero nominum eorum per labia mea. [ Their infirmities were multiplied: afterwards they made haste. I will not gather together their meetings ]for blood offerings: nor will I be mindful of their names by my lips. Condition : Good but browned.